Danielle resides at her own apartment in Champaign and works at DSC’s Clark Rd. location as a materials handler. She is very active in the Self Advocacy Group and is looking forward to the annual summit meeting coming up in November. The summit is usually held in Springfield, IL. Danielle mentioned that they will be staying at a new hotel this year and she hopes it will be a nice one. 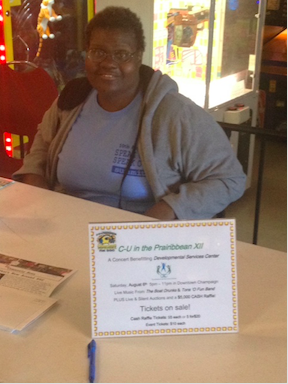 In addition to participating in the Self Advocacy group, Danielle has been out helping sell our raffle tickets for CU in the Prairibbean coming up on August 6th. Danielle enjoys spending time with some of her favorite DSC employees. She is appreciative of all the support they offer her, such as taking her to her doctor’s appointments. In her spare time, she enjoys watching game shows on television. Some of her favorites are Wheel of Fortune and the Price is Right. She also participates in CUSR activities such as Blackout Bingo, a BBQ, and Karaoke. She is planning to join the Special Olympics Bowling Team this year.